Your mail and parcels will arrive at their destination looking as professional as when they left your door, with Avery® Crystal Clear Laser Labels. They are durable (oil, dirt, splash and tear proof), and 100% transparent, so your mail, parcel or gift looks clean and professional. The labels can also be used on glass polished surfaces, plastic or metal surfaces. Developed for laser printers and guaranteed Jam Free. 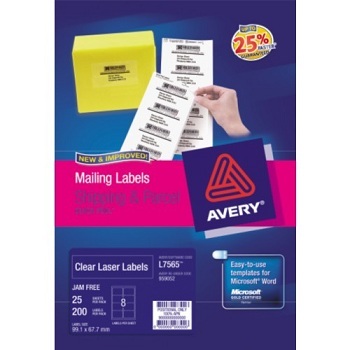 Avery Clear Laser Labels ideal for shipping use, large boxes and packages. A4 Size - Clear - Permanent adhesive. Avery Clear Laser Labels ideal for shipping use, envelopes and small parcels. 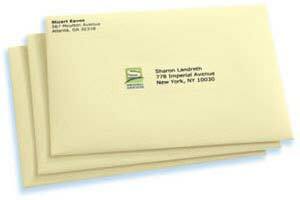 Avery Clear Laser Labels ideal for mailing and addressing, particularly DL envelopes. 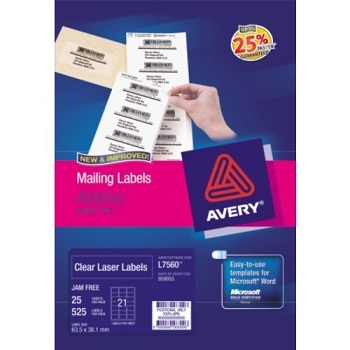 Avery Clear Laser Labels ideal for mailing, recommended for return addressing.